It’s going to be nifty, to be sure! There’s been precious little knitting shown here of late, an egregious oversight for a knitting blog. 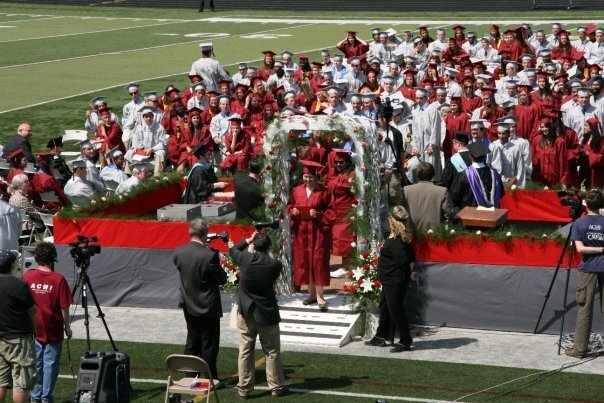 As usual, I plead too much work and too little time, with the added complication of kid graduations/celebrations – Elder Daughter from high school, and younger daughter from elementary school. Fun events to be sure, complete with family/friends, but time consuming none the less. That’s a 2mm, by the way. At this point I don’t dare let it free from the stitch keeper unless I’m actually working on it. The thought of dropping those thread-fine stitches makes me hyperventilate. The good news is that I’m only 40 or so rows from completion. At the rate of 1.5-2 rows per week, I’ll be working on this for quite a while yet. I do have an interim knitting decision to make. This is NOT a good piece to take with me on our midsummer vacation. It’s best worked on in one spot (you can see I didn’t move it far from my favorite knitting chair for the photo, above). But what to bring? 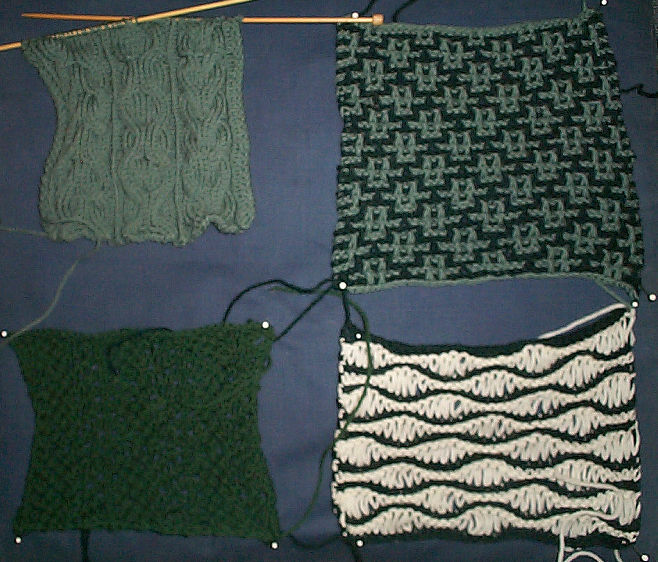 Not much knitting progress this week. 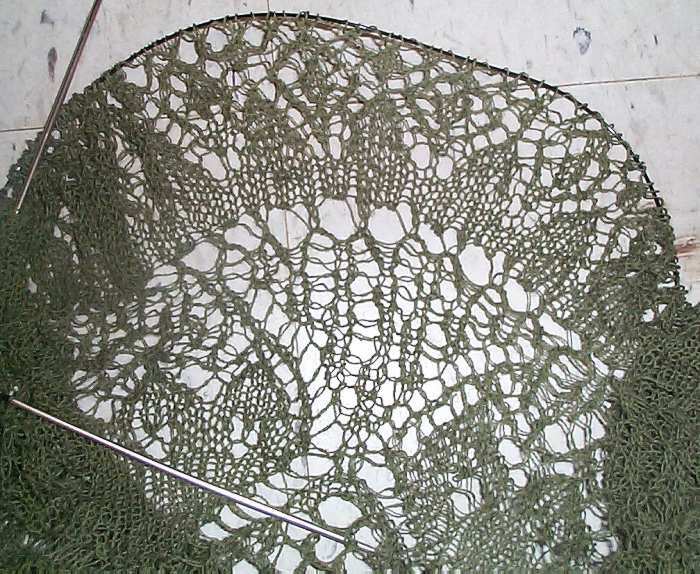 I picked up the olive tablecloth after my sock urge was sated, continuing to produce a couple more inches of the spiderweb section. Then I moved to the set-up round for the final edging. Unfortunately, I made a mistake early on that I did not catch for four more rounds. At ten zillion stitches per round (most of them incorporated into double decreases separated by double yarn overs), the tinking back has been painfully slow. But I’m finally past it and moving forward again. In the left hand shot below, you see the spiderweb section. In the right hand shot, a bit of the center medallion’s outer band motif. 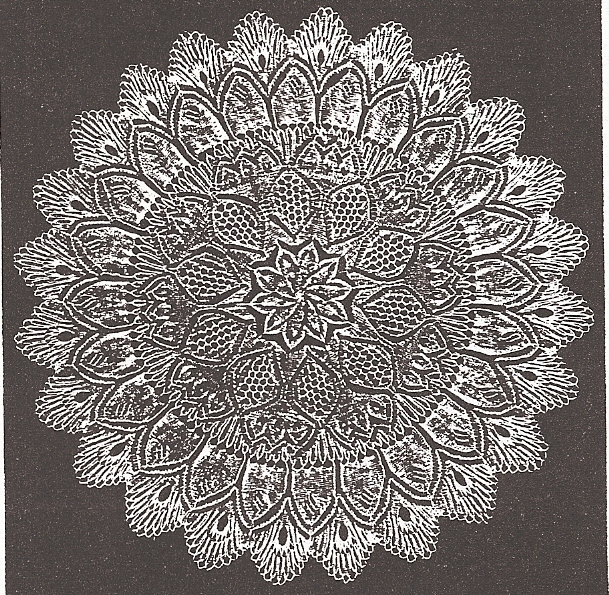 To recap, the center of this tablecloth is from The Knitted Lace Patterns of Christine Duchrow, Volume III, edited by Jules and Kaethe Kliot. The center is on page 72, charted on p76. As I neared the end of that medallion I decided I wanted to make the cloth bigger. Thumbing through the same book I found the edging on page 56, charted on p. 57. I apologize for not having pix of the edging, but my scanner is playing dead tonight. In any case, the math worked out, so I decided to merge the two patterns. Success however isn’t guaranteed. 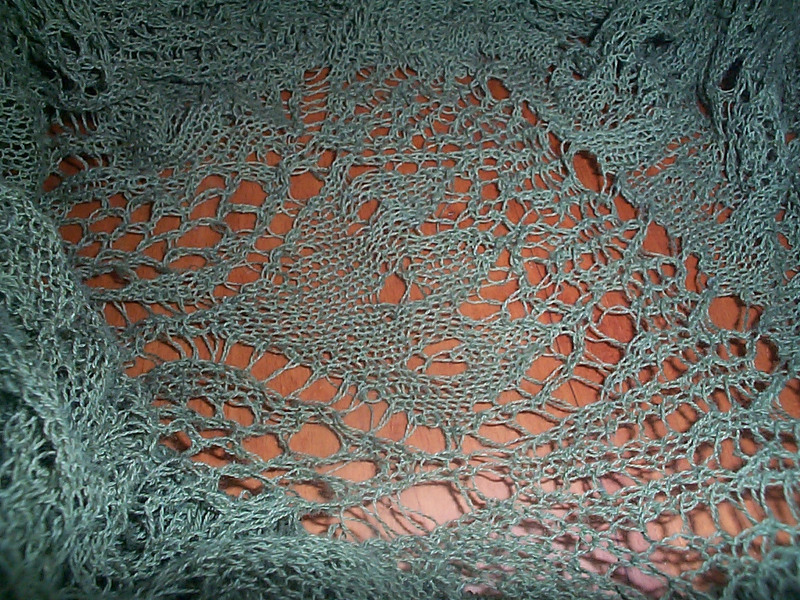 Although the spiderweb portion is very forgiving in that it will resist ruffling due to the ability of its brides (the horizontal twists of the double YOs) to compress, it may well ruffle when the peacock like terminals of the pattern are added. The trick is to make the spiderweb portion wide enough. It’s a clear gamble. Too wide, and the cloth won’t lay flat. Too shallow and the piece will ruffle at the edge. Add to that the fact that the pattern as written is for edging a smaller circumference; that I’m working in a fine linen thread – guaranteed not to be a cooperative, stretchy blocker; and that I’m working with all of the stitches jammed onto a way too small circ, making it hard to judge how flat everything is working out. It’s an Adventure in Knitting, to be sure. Even with all of these disaster factors and putting the piece down for several months, I’m having fun with it. 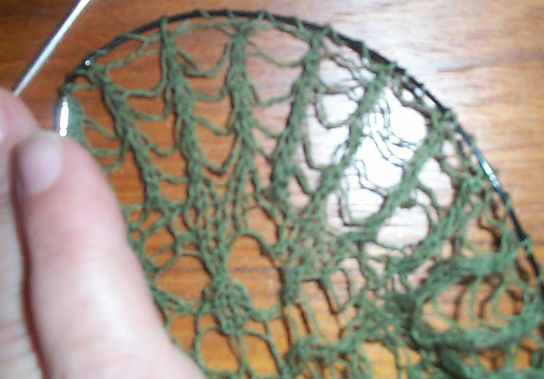 I find that I really enjoy noodling out lace. With the end in sight on this one, I’m not sure what I’ll do next. Probably something more scripted with a lower chaos factor. 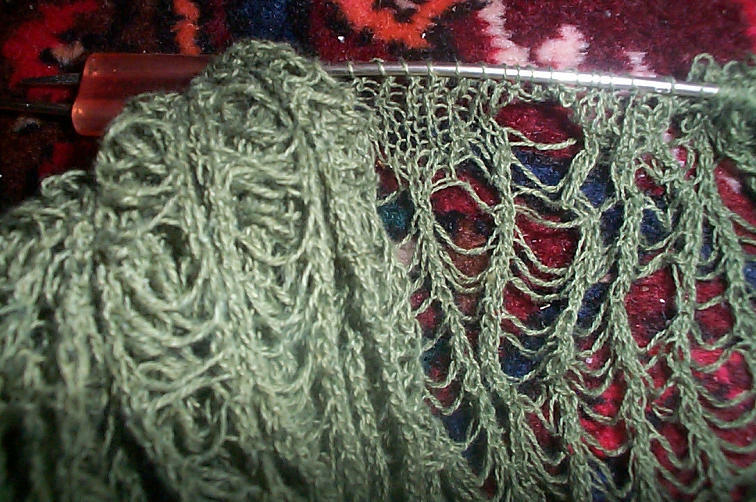 One possible candidate is Heirloom Lace’s Princess Shawl. I bought the pattern a while ago, before it was revised and expanded. I am considering doing it up in the black laceweight I just bought. But there are so many other things to knit. I need to work more on my North Truro Counterpane. I would dearly like to finish it off and use it as a summer weight blanket. Someday. And if I don’t finish Elder Daughter’s Kyoto and dragon skin Rogue, she’ll have my head. And there’s the Sempre pullover from this past winter. And projects even older languishing in my Chest of Knitting Horrors(tm). Finally, some folk have written to me to complain that I mis-characterized the gentleman spinner in the last post. Apparently he’s Dan of Gnomespun Yarn, and he’s got a huge following in the hand spinning/blogging community. I meant no disrespect. On the contrary, I was quite taken with his matter of a fact attitude and general uber cool confidence. So was my photo-taking friend. So all the best to you, Dan. Should our paths ever cross again, I’ll be sure to introduce myself and buy you a drink to make amends. Any other complaints about this blog or its contents can be sent to me either care of this website or at my wiseneedle inbox on Ravelry. Another week of low inspiration here. 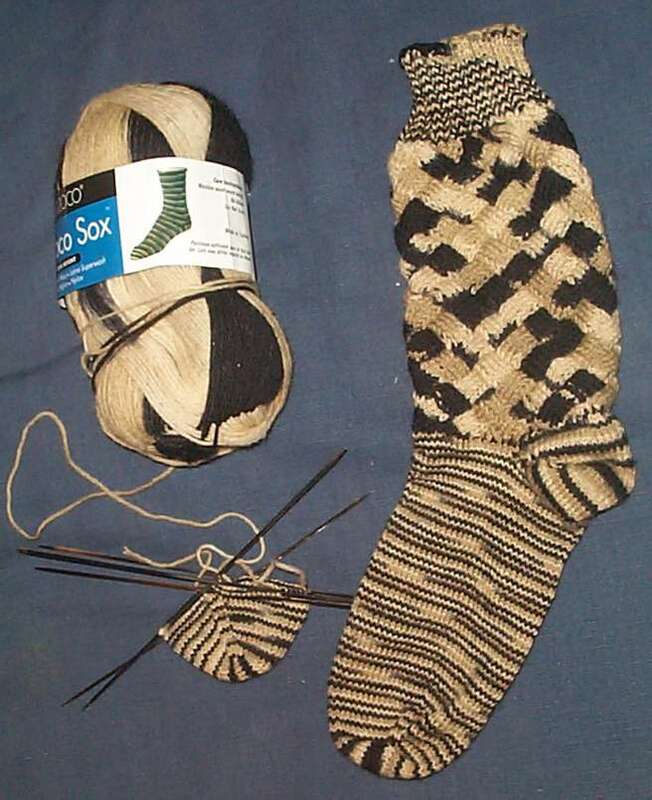 I’m half way through the brown/tan/ecru entrelac socks. They’re working up nicely, but as I mentioned last week, the yarn has had lots of knots in it, one or two interrupting the color progression, but most clearly knotted before the stuff was dyed. I’m not pleased and will consider greatly before buying Berroco Sock again, even though I like its other properties that are so similar to more expensive European label sock yarns. I’ve also picked up my olive tablecloth again. Rounds are still interminable, and nothing much interesting has happened since I put it aside last year. I’m still in the spiderweb section, with at least eight more rows of that two-row pattern before I have enough width to consider moving on to the final design element. 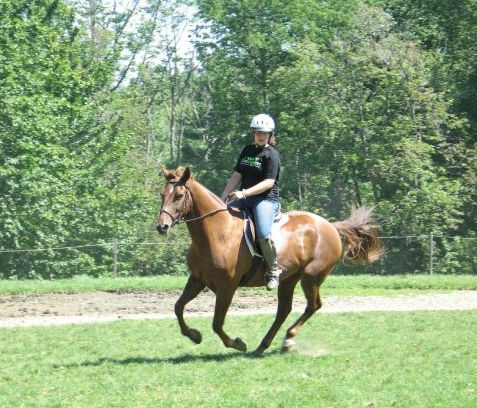 I share my last olive picture again. The piece now looks the same, except the spiderweb around the outer edge is now about twice as deep. And finally, in yet another traditional blurry String picture, I show off a partially completed embroidery. This one is a true sampler – a piece that exits only to try out random counted patterns. I had no particular goal in stitching it, it wasn’t intended to be displayed and remained a work in progress. The super long repeat in maroon shown separately is one of the design candidates for my curtain project mentioned here before. That work is still in the larval planning stages, mostly pending finding an affordable close to even weave linen or linen look alike. Gauge on this sampler is approximately 15 stitches per inch on 30 count linen, in DMC Danish Flower Thread. Stitches used are cross stitch (green at top left), double running (grapes down center of piece and the two-tone framed flowers bit), and long-armed cross stitch (the extra long repeat). At this gauge the red repeat is just under 3.25 inches wide. To make my curtains less of an aeons project and to achieve the heft I want for my curtains, I’m looking for a plain weave even weave of about 12-15 threads per inch. That would make my stitched ribbon about six inches wide. Considering that I would need four panels to cover my windows, each 71 inches long x 35 inches wide, the six inch strip width would be in proportion to the rest of the project. 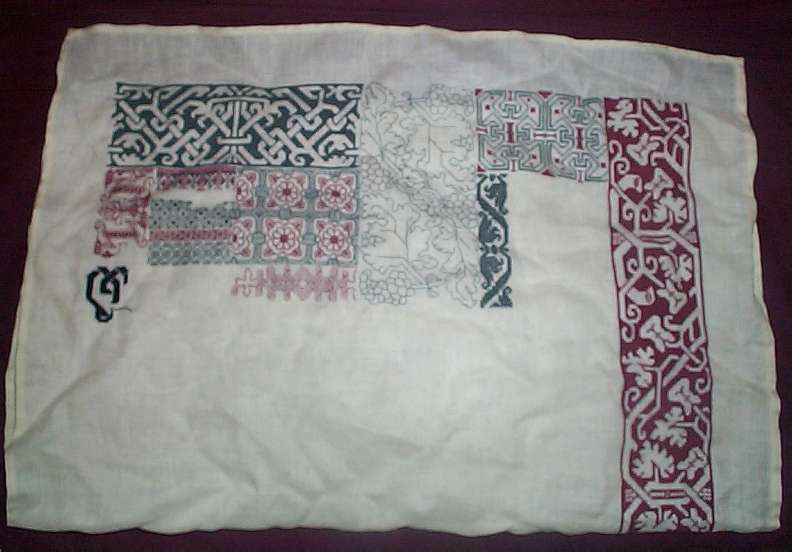 But I haven’t found the linen yet, and certainly haven’t had the time to start, so my embroidered curtains remain a mental exercise for now. 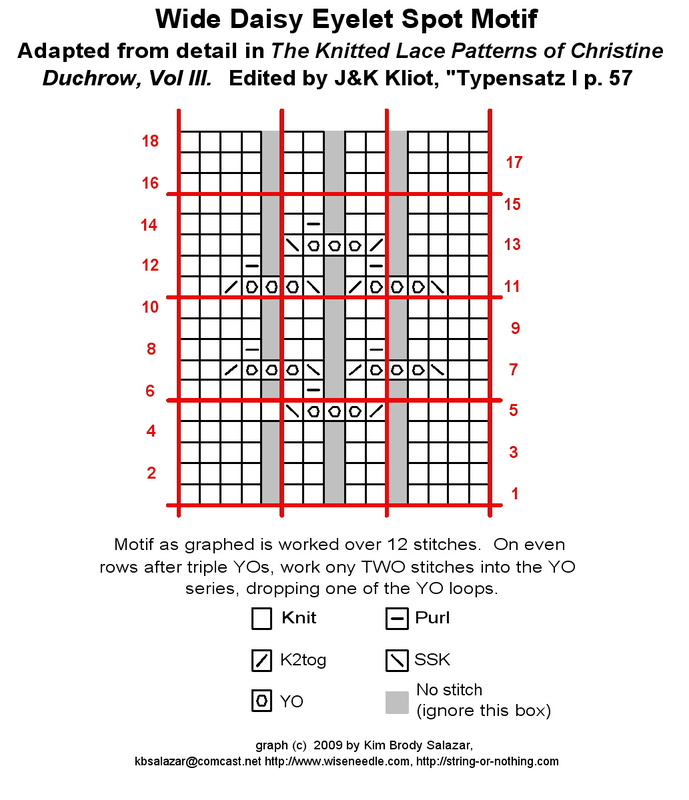 Graphs for all of the patterns on this piece except for the small bans of field filling squaring out the area immediately to the left of the frame flowers can be found in The New Carolingian Modelbook. DMC DFT is now discontinued, which is one of the reasons why my play sampler ended up in my Chest of Knitting Horrors(tm). Elder daughter’s Walker Learn to Knit book afghan continues to grow. She’s working in Cascade 220, in assorted greens gleaned from the orphan skein shelf at Wild & Woolly in Lexington (our local yarn shop). 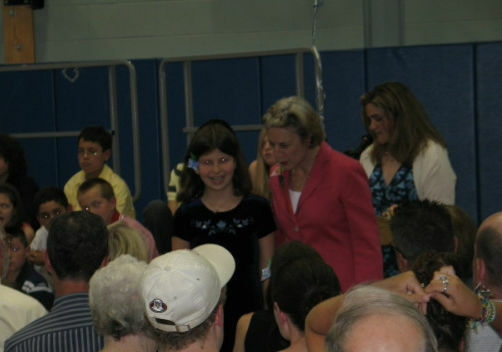 Her goal is to have enough finished by next fall to furnish herself with an off-to-college blanket. Younger daughter has decided that crochet is easier for her to handle than knitting, and armed with books from my library and yarn from my stash, is making a stab at a zig-zag blanket for her favorite stuffed animal. So the transmission of obsession is prospering here at String. 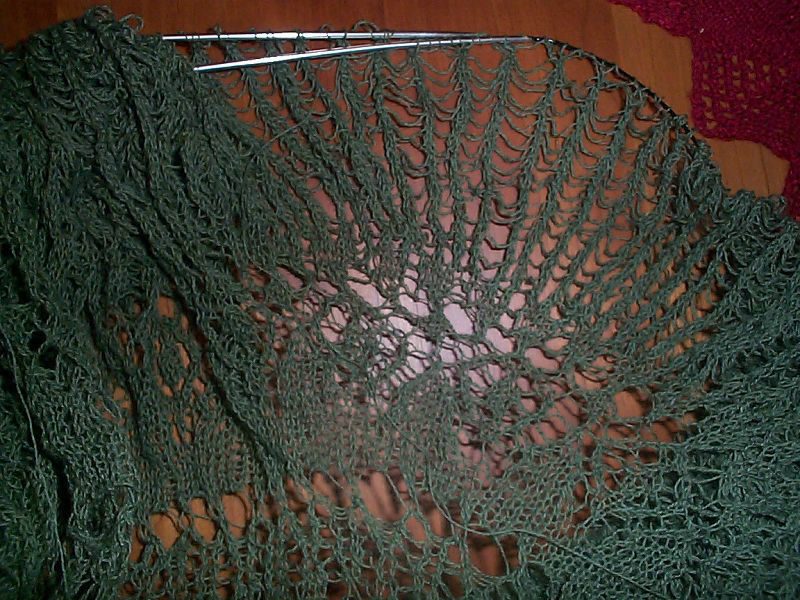 On my own knitting – I am making good albeit slow progress on the olive green tablecloth. The section I’m working now is rather spider-webby. It’s an eternity of rows alternating between [S2-k1-PSSO, (YO)2] and [K (K1,P1)] to make an infinitude of center double decrease columns with large eyelets between them. Given that the piece has something close to 1,200 stitches per round at this point, each row takes forever. Especially the double decrease row. The last thing I want to do is miss a loop. So progress is slow to accumulate, especially because I want this spider web area to be at least six to eight inches deep (yes I do have the play in the linking brides to accommodate the fixed stitch count of this patten and corresponding total diameter increase of the round cloth over the added depth). In other news, I heard that a local yarn source is closing. Not my favorite shop (thank goodness), but a two-outlet big-box store that focused mostly on fabric and decorating, that greatly expanded and then shrank its yarn department in response to the scarf knitting fad of a couple of years ago. I was always ambivalent about it. Although I did buy fabric there on occasion, didn’t buy their yarn because I wasn’t fond of that store’s effect on other area yarn shops. At one point they absorbed several of the better mid-range suppliers’ products, then using their volume purchase to engineer discounts from the makers, sold those yarns at prices significantly lower than smaller stores could manage. Doing this they cornered the market on (for example) Plymouth Lopi. Small knitshops could no longer afford to stock it and lost significant foot traffic as a result. Now the big box store is closing. No more yarn, no more fabric. Now the reversal of yarn sales wasn’t the cause. I suspect rising rents (the mall in which it is located has expanded considerably in the past two years), the general decrease in discretionary spending (much of their revenue was from their home decoration department), and a decrease in interest in quilting and home sewing in general. Most of the times I hit the fabric department, I was the youngest person shopping, and being a Boomer, I’m no longer a sweet, young thing. Changes in the economy, changing customer demographics, crashes in the popularity of multiple hobbies, rising infrastructure costs all add up to the loss. Now there’s a new problem. Where to buy fabric? What’s left in the inner/outer suburb belt here is woefully inadequate – shops that have scaled back their sewing departments in favor of scrapbooking and other low-investment/low skill hobbies. There are a couple of small stores scattered around, useful but with very limited stocks. I haven’t been downtown to what used to be the garment district in Boston in years. It used to be the home of several stores where bolts went to die – remnant shops and mill end type places. But that was long ago, and that neighborhood has gone upscale. In the mean time, I note the store’s passing, plus the closing of a couple of the smaller yarn shops that opened up at the crest of the scarf knitting fad, and hope that retrenchment will leave us with local yarn stores. I for one need to see and feel yarn for inspiration – the texture, the drape, the weight, the loft, and most of all – the color. I can’t buy blind off the web, based on photos, descriptions, and reviews – even those on wiseNeedle. I value the expertise and help available at local shops, and am willing to pay a small surcharge per skein to support that help (rather than spending it on shipping). And most of all, I like the experience of seeing and evaluating alternatives in person, being able to take leaps of inspiration based on the stock of yarns and patterns at hand. Perhaps the rise in Internet yarn shopping is part of the stampede towards sameness I see across many knitters’ projects reported on line. Someone knits something, and it turns out quite well. Other well-connected knitters see the success and want to duplicate it. So they too buy the same pattern and same yarn. Both being known entities, purchase sight-unseen is a viable option. Now there’s absolutely nothing wrong with doing any of that, knitting up something that’s a proven winner, or using the exact yarns (or even colors) specified in a pattern or that someone else has used. It’s safe. It’s proven, and the chances of success are magnified. But it’s not the way I knit. And I’m guessing that there are other “bungie jumping” knitters out there that find the proliferation of the latest got-to-knit item stifling, and yearn for a wander through a warren of tactile and visual inspiration. If you’re out there, please speak up. And visit your local yarn shop before it’s gone, too. Now it’s the double-time quick slide back to lunch boxes, homework, and maternal nagging. On the olive green tablecloth – progress continues. I decided to add width by continuing to knit center out rather than adding an edging knit around the circumference. I did some planned increases in a solid strip to bring the stitch count up to a multiple suitable for working an extended pattern I found on another cloth in the same Duchrow volume. It’s a wide panel of [K3tog, (yo)2x] ground, with all of the triples aligning to make prominent radial ridges. Sort of close-in spiderwebby. I’ll work them though as center double decreases to increase the effect. 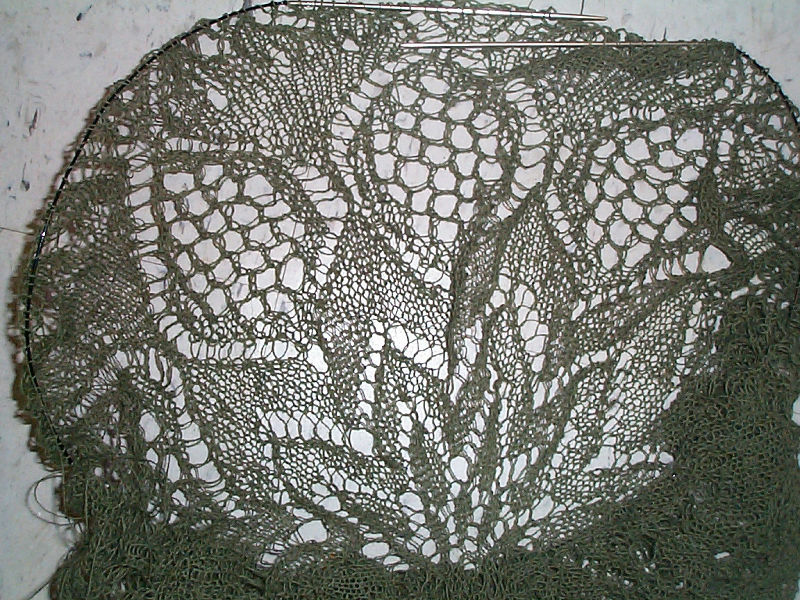 When the panel is about 5 inches wider (about 10 inches total in diameter for the entire cloth), I’ll branch out into the plume-like/peacock final pattern from the Duchrow instructions. My only concern is that I may have to rip back a bit and start again. I think that the new area is a bit rippled. I probably should have continued for a couple more rows of plain stockinette before launching my chosen ridge and terminal frond pattern. I’ll know for sure after the next row. If anyone is keeping track, my circumference is now something like 960 stitches around. Knitted lace high stockings. I can do that! Perhaps I will. Elder Daughter would probably have a fit of delight to receive a pair. For the record, some look like they have stirrup bottoms rather than full feet, and some are listed as tights, meaning they have a pantyhose style integrated top rather than just a stocking and garter tie like the leftmost offering in the pix above. 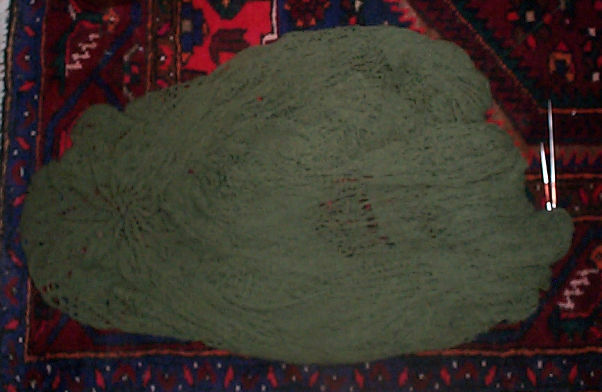 To take a break from baby gifts, I picked up my green lace tablecloth this weekend past. I’ve now made my way to the end of the charted patterns. The last two rows of the second chart are a bit confusing for non-German speaking users. I finally figured out that they refer to a crocheted bind-off. 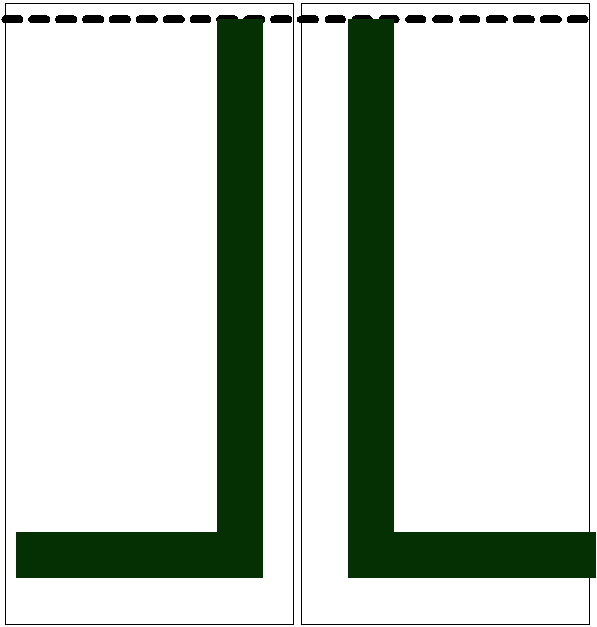 The lower row symbol (either the number 2 or 3) indicates how many knit stitches are to be gathered up in a fastening single crochet, and the upper row number symbols indicate how many chain stitches are to be created between those single crochets. But I didn’t do the indicated bind-off. I estimate that if bound off now, my piece would be about 45-48 inches across. I wanted a piece that was 52 inches or more around. That means I now am off in the land of improvisation. I did the penultimate charted row by working k3-tog or k2-tog as indicated, but adding the “subtracted” stitches via yarn-overs, trusting that I could get away with one row that didn’t add a ton of stitches to increase total piece diameter. Now comes the problem of what to do next. I do have to add a considerable bit of depth. I don’t think that an edging strip knit around the circumference will be deep enough all by itself. I think I’ll have to work another coordinating segment, knit center-out before launching into any as-yet-unspecified pointy or dagged edging. Unless I can find one of the particularly deep edgings that sports “collar properties” – that is significantly wider along the free side compared to the attachment side, so that it naturally conforms to a collar-like, graceful curve. Now I know there are quite a few of those out there, but whether their repeat length, increase ratio, and motifs work well with the stitch count and pattern of the base cloth will all contribute to my final decision. Not much progress here. My knitting (and blogging) time is severely curtailed by work obligations. I have moved a bit further into the pattern. It’s slow going. In addition to not having lots of time to sit down and make an systematic investigation – the pattern itself continues to present challenges. I’m still struggling with the $ notation. Sometimes it means k1tbl, sometimes it means k2tbl. At this point I’m using the chart as a point of base information on my quest to make the finished knitting look somewhat like the book’s engraved illustration. Each row is an exercise in winging it, with occasional rip-backs after a repeat or two if they don’t quite work out. As you can see – I’m close. 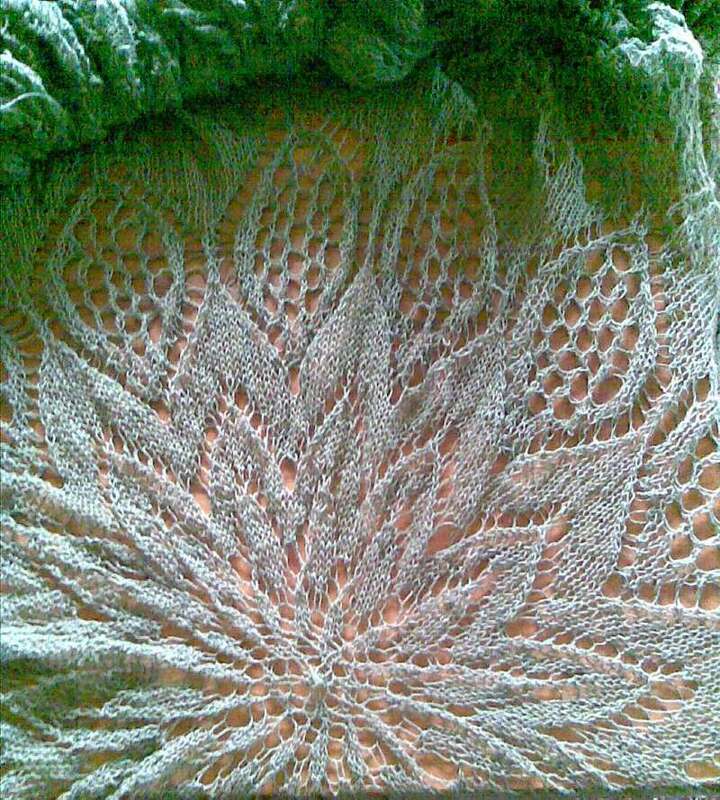 Right now I’ve just finished the row where the triple peacock tail like elements are topped off with a double decreases, bringing their three lobes to sharp points. After that I’ve got a couple of rounds of a ground type pattern with vertical stripe like lace bars, then I launch into the supplemental graph for the zillion petal border repeat. It’s hard to say exactly how large this piece is right now, all scrunched together in typical snood-type style on my circs and unblocked, but I estimate that I’m at about 24 inches across. Based on a crude assessment of proportions, I’d say that by the time I’m done with the petal section, I’ll be at 36-40 inches across. Still too small for my intended table, but I’ll worry about that when I get there. Maybe I’ll add another simple ground element, and then a judiciously chosen edging knitted around the circumference as opposed to center-out. I take it from the astounding silence on recent projects that I’m pretty much the only person in the blogosphere (or at least the tiny minority of the knitworld that visits here) who is working from the Duchrow books. This is a pity, because in spite of the difficulties I’m having now, they are a marvelous source of inspiration. Don’t be daunted by the antique notation, the fact that they’re written in another language, and that on occasion a bit of creative insight has to be applied to make things work out well. This last bit hasn’t been common. I’ve worked up about a dozen items from various Duchrow charts and this is the first one that’s been a struggle. This stuff is Xtreme Knitting at its purest. If you like lace and like a challenge, consider this set. Rats. I just noticed that I knocked two repeats off the end of the needle getting the radius measurement. Perfection in my work as in everything else, is asymptotic. I imposed upon a German speaking co-worker today, asking if he could help me with a line or two of the Duchrow annotation. Although fluent in his native language, he didn’t speak knitting, but between the two of us we pieced together a bit more detail. It turns out that the instructions on this one have a special note that II is in fact to be interpreted as one YO, not two. 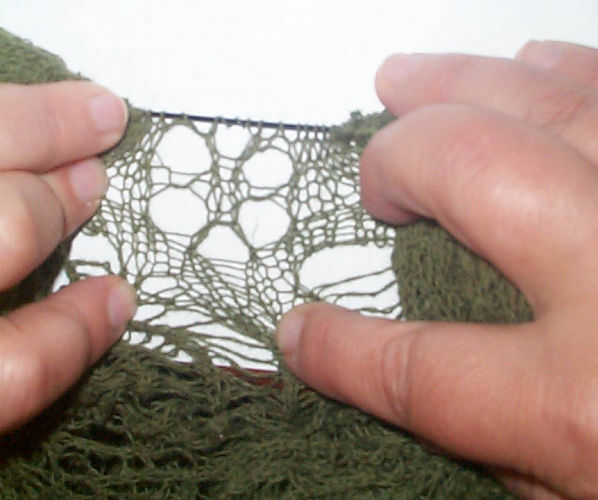 But again – about half the time in order to make the required stitch count on the next patterned row the intervening plain knit row needs to place two stitches into that YO. There is no alternate direction on when to k2 into a YO and when not to do so; nor is there direction on when $ means k1tbl, and when it means k2tbl. So even though I now have the relevant bit of annotation translated, I am no more enlightened than I was yesterday. The yarn I’m using was a gift. 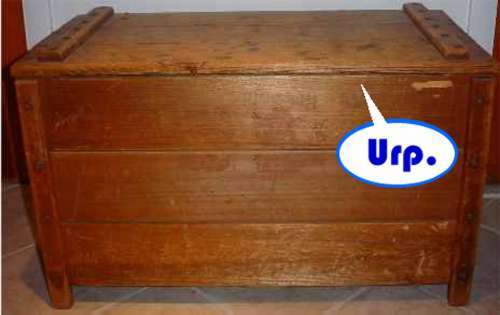 I’m afraid it has no brand name, and I’m unfamiliar with its original provenance. I’m knitting directly off the cone. I haven’t bothered to rewind a smaller quantity. I don’t have a good feel for how big my final piece will be, and that doesn’t bother me one bit. The directions say that the finished cloth is around 60cm (a little over 23.6 inches), but I think my piece will be larger. Probably on the order of 30-33 inches across if I work it as given. I’d like to go significantly larger – possibly 56 inches across. I may add a course or two of other repeats. We’ll see when I get there. There’s a ton of yarn, so the only limits are my own perseverance and willingness to tinker. Now I have questions of my own. Is there anyone else out there working from the Duchrow series? If not those books – has anyone knit from the K. Ichida “Knitted Lace Designs of the Modern Mode” series – the Japanese language Modern Lace series reissuing classic European patterns? Progress? Not really. I’m entering another chaos period at work, and had to rip back tonight. I managed to drop some stitches when I did yesterday’s photo. I wasn’t able to rework them, so I had to go back four rounds. Three steps forward, one step back.